Waterscape Deluxe is a stunning property that will take your breath away. Located on the second floor, the view of the lush gardens and beautiful Lake Cay is unbelievable. Elegant furnishings with modern touches make the living room a great place to stretch out and relax! Enjoy your favorite TV shows or watch a movie on Netflix on the 50-inch smart TV. 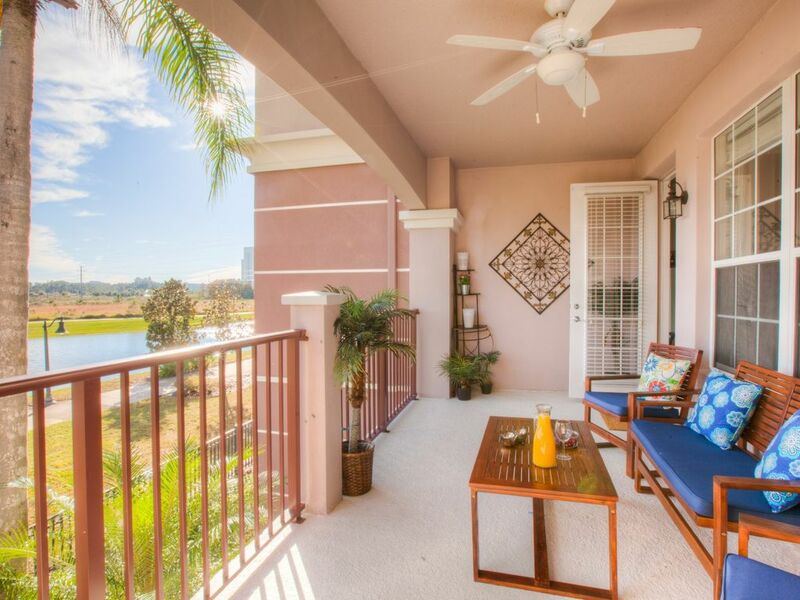 If you’d rather enjoy the view, a large covered patio is furnished with table and chairs for eating meals al fresco, or simply taking in the view with a cocktail. A gourmet kitchen with granite countertops and stainless steel appliances make preparing a delicious meal for your family a breeze, or create a fancy spread for entertaining in the formal dining area, complete with a table and seating for eight. The breakfast bar in the kitchen can seat four more guests at stools. The master suite hosts a massive king bed and adjoining bath with large soaking tub, full walk-in shower and dual sinks at the vanity. The second bedroom has a queen bed, and two full beds make up the third bedroom. All bedrooms have their own TVs, so everyone gets to watch what they want! Vista Cay Resort is right next door to the Orange County Convention Center, and less than 10 minutes away from all major theme parks, including SeaWorld, Universal Studios and Walt Disney World. Make memories with your family and create an unforgettable vacation experience by staying at the Vista Cay resort in the Waterfront Palms. The condo is a great location to Universal Studios. It is very large, clean easy access and near restaurants, food store and pharmacy. A little light on the toilettres. The family had a good time. Great location, sizable condo that was exactly as shown in the photos. Comfortable, clean and relaxed environment. We have stayed at Vista Cay several times, and this was one of the best units we have ever stayed in. Thank you for creating such an inviting 'home away from home'. I hope to stay in this condo again in the future. It was great experience for me and family.we enjoyed staying at your premises. The view was amazing. You may nerd to review your prices for long stay customers.